Whether it’s for help with their injury legal matters or advice on estate planning issues, people are turning to the web to find local law firms. When people begin searching for local businesses in their area, they tend to do multiple searches. They might search for a list of law firms and then search for specific information about each. For example, they might try to identify which one has experience handling legal matters like theirs. Last month, Google introduced Place Search, a new type of localized search result that sorts information around local places. These new results are marked with red pins, and contain relevant information and links from across the web. 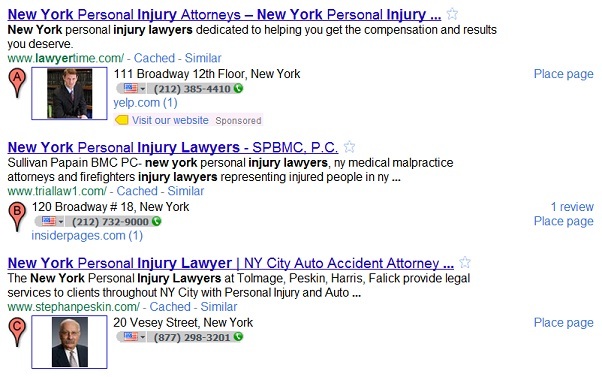 Now, local legal services searchers can see location and contact information right from the results page. In addition, searchers can see place information gathered from a variety of other sources all in one place. Welcome to our law firm web strategy blog. Since we advocate that our clients’ legal blogs have “purpose” it’s only fair that we spend a moment to outline our intentions for this blog. Our intention in publishing this blog is to provide legal professionals with advanced web marketing strategy. While there are many legal internet marketing blogs that provide great information, when it comes to some of the more advanced strategies, there seems to be something lacking. We hope this blog provides you some useful information in marketing your law firm online. Please feel free to submit questions that you might have or ideas for posts that you would like to see published here.